Just before arriving along the shores of Dream Lake a majestic view of Hallet Peak comes into view. 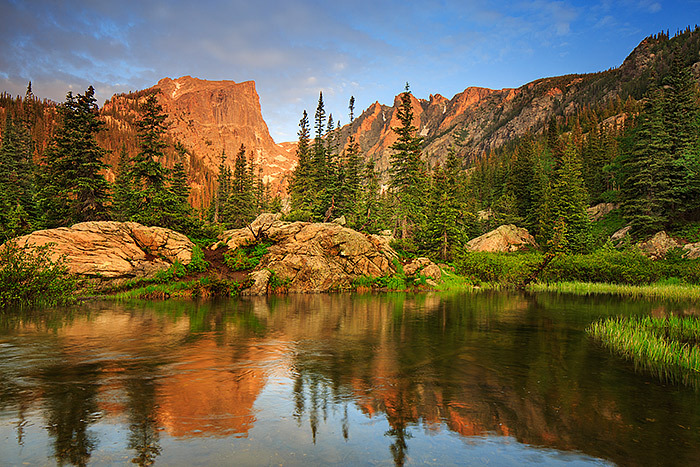 While the view of Hallet Peak from Dream Lake is iconic, this view from below the outlet of Dream Lake is just as beautiful. Water streaming from the outlet of Dream Lake forms this small tarn which also happens to reflect Hallet Peak and Flattop Mountain perfectly. Photo © copyright by Thomas Mangan.